Common Goldenring (Cordulegaster boltonii). Male. Taken at Haddon Hill, Somerset, on June 18th 2015. Approx 1.75x lifesize. Male. Taken at Haddon Hill, Somerset, on June 18th 2015. Common Goldenring (Cordulegaster boltonii). Male. Taken at Crockford Stream, Hants, on July 15th 2011. Approx 1.75x lifesize. Male. Taken at Crockford Stream, Hants, on July 15th 2011. Common Goldenring (Cordulegaster boltonii). Female. Taken at Silchester Common, Hants, on July 1st 2018. Approx 1.75x lifesize. Female. 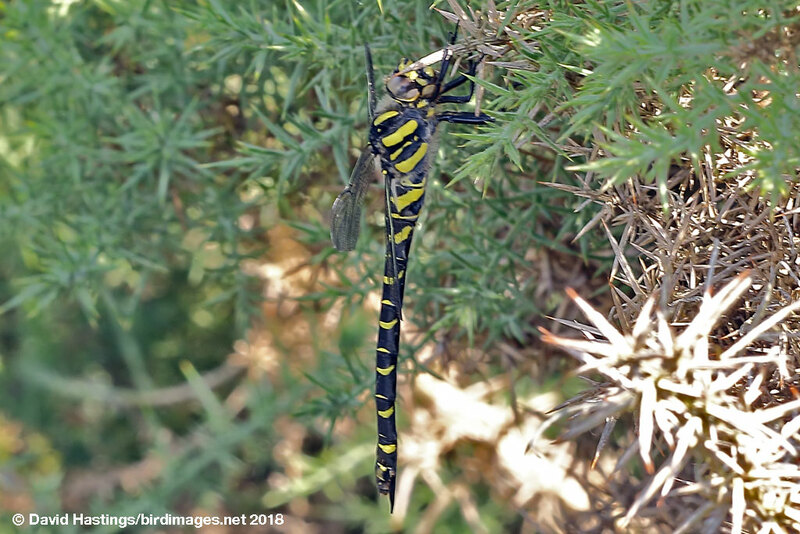 Taken at Silchester Common, Hants, on July 1st 2018. 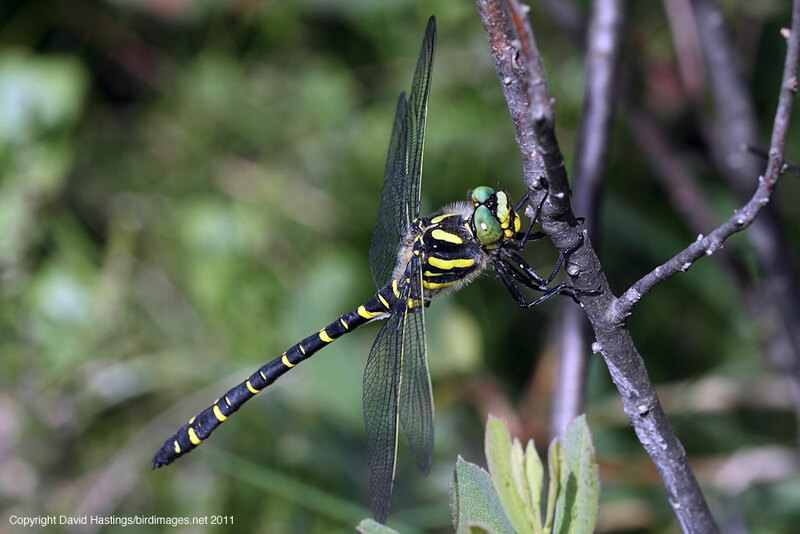 The Common Goldenring is a distinctive, large and impressive dragonfly. The sexes are similar, with green eyes which meet at a single point. The thorax has black and yellow stripes, with tapering yellow antihumeral stripes. The abdomen is black, with alternate broad and narrow yellow rings. The wings have a yellow costa. The male's abdomen is slightly waisted at S3, and it is swollen at the tip. The female's abdomen doesn't have the waist at S3, but it does have a long ovipositor which extends straight out beyond S10. Immature specimens are similar to the adults, but have brown eyes. It is found in western England, Wales and Scotland, but is absent from Ireland. It favours streams and small rivers which have acidic running water, with sandy, silty or peaty bottom debris. The eggs are laid while the female jabs her ovipositor into the stream bed. The larvae live at the bottom of the watercourse, covered in debris, for 2-5 years. The flight period is June to September. The males are territorial, and patrol up and down suitable breeding waters, their slow flight being interspersed with frequent hovering. Adults often hunt away from the breeding sites, such as amongst bracken, heather and gorse. A common and widespread species in western Britain, very local elsewhere.